It’s impossible not to love everything about this book. 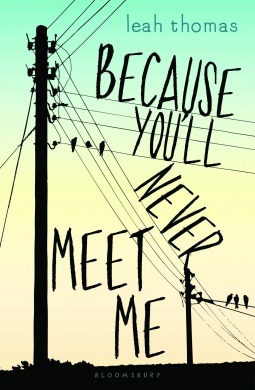 BECAUSE YOU’LL NEVER MEET ME is told completely in letters between two boys who’ve never met. In fact, if they did meet, one of them would most likely die. The book starts off with a letter from Ollie, a boy who lives in the middle of the woods, isolated from society with very good reason: He is allergic to electricity. Moritz, on the other hand, has an electric pacemaker. On top of that, he is eye-less and has mastered the art of echolocation to navigate his way around school. Their letters convey their unique stories — Ollie’s relationship with a girl named Liz and Moritz’s troubles with a bully. Through their correspondence, the two find both friendship and hope even in the tragedy that tied their pasts together. I have a love-hate relationship with epistolary novels. Either they are beyond fantastic and use the format wisely or they sound overly pretentious. I’m happy to say that Leah Thomas’s debut novel is exceedingly well written. Every letter shows something new about Ollie or Moritz and the characters’ voices couldn’t be stronger or more clear-cut to the reader. Ollie’s quirky optimism and the thawing of Moritz’s cynical heart are truly inspiring, not to mention that their letters are filled with humor and some great one-liners. BECAUSE YOU’LL NEVER MEET ME is also incredibly self-aware. With the element of a mysterious laboratory past and the two characters’ weird circumstances, the reader can’t help but draw comparisons to Matt Murdock’s sightless superpower or Electro’s relationship with electricity — but the book beats you to it by actually bringing up the Marvel comic books. It takes a little suspension of disbelief, since the novel has the tone of YA contemporary fiction but soon dips into sci-fi. However, the poignancy and surprising truths about life help ground the plot. The danger of writing in letter format is that one character’s story may overpower the other. But what surprised me is that Thomas makes each and every chapter emotionally greater than the one before. The best part is, you’re truly living the life of either Ollie or Moritz as they recount their stories to each other. You have been warned, reader: you’ll fall in love with these strangely wonderful characters and their bizarre lives from the first page. If you combine the grim nature of fairytales with a paranormal YA vibe and set it in 17th-century France, you end up with CRIMSON BOUND, and somehow, it all works out beautifully, like a layered, detailed painting. 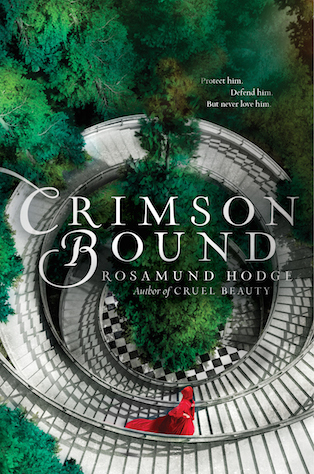 Inspired by classics such as “Little Red Riding Hood,” “The Girl Without Hands” and “Hansel and Gretel,” CRIMSON BOUND tells the story of Rachelle, a headstrong girl who encounters a creature called forestborn, a former human with strong, invincible, murderous powers. By committing a terrible crime, Rachelle becomes bloodbound, one step closer to transforming into forestborn. Rachelle attempts to atone for her mistakes by defending the kingdom with her inhuman speed and skill. When she is forced to guard the King’s son Armand, whom she despises, she forces Armand to help her find a sword that will save the world from the god of the forestborn, the Devourer. As the two begin to explore the realm, they discover long-forgotten magic, conspiracies and love in unexpected places. What a refreshing dip back into the fantasy world! Though the above synopsis may sound confusing, author Rosamund Hodge paces the narrative perfectly so that it doesn’t take more than a few pages to get the gist of the unique magic employed in the novel. Hodge’s world-building is well-constructed and creative. Her characters are also quite unlike those in any other YA fantasy novel I’ve read, with Rachelle’s self-hatred, Armand’s wryness and Erec’s deadly playfulness. CRIMSON BOUND is a page-turner with the unpredictability of a rollercoaster. There were reveals and plot twists that actually sent a jolt down my spine and made me rethink everything that had happened leading up to that moment. The spin on well-known fairytales is fantastic, especially when all the stories meld effortlessly together. Hodge goes back and forth with ease between a folklore-ish, Brothers Grimm-style voice and a modern tone that fits the protagonist well. CRIMSON BOUND is a surprising, one-of-a-kind fantasy novel with the epic battle of good and evil, where perhaps the “good” may not be righteous. ONE THING STOLEN is written in watercolor — it’s beautiful, poetic and arresting. Nadia Cara is a girl who recently moved to Florence, Italy. Not only does she feel lost in the gorgeous city but she’s lost the ability to find the right words when speaking. She begins to steal pretty things that catch her eye and weave nests out of the objects she’s collected. When she meets an elusive boy in the city, she finally feels like she’s found someone who understands her. However, Nadia can’t tell the difference between reality and fantasy as she descends into the snares of a rare neurological disease. She tells herself the boy is real, although the reader knows better than to trust this narrator. The book reads like poetry, with fragmented sentences and vivid imagery. Metaphors abound and sometimes the plethora of images presented is too disjointed for the reader to truly picture the scene, but I believe this represents Nadia’s disoriented state of mind. It leaves you with an overall feeling of breathlessness and the wish to see the world through Nadia’s eyes. The symbols author Beth Kephart chooses are significant and will stay with the reader long after the last page — names, birds, nests, floods, foreign languages, churches. 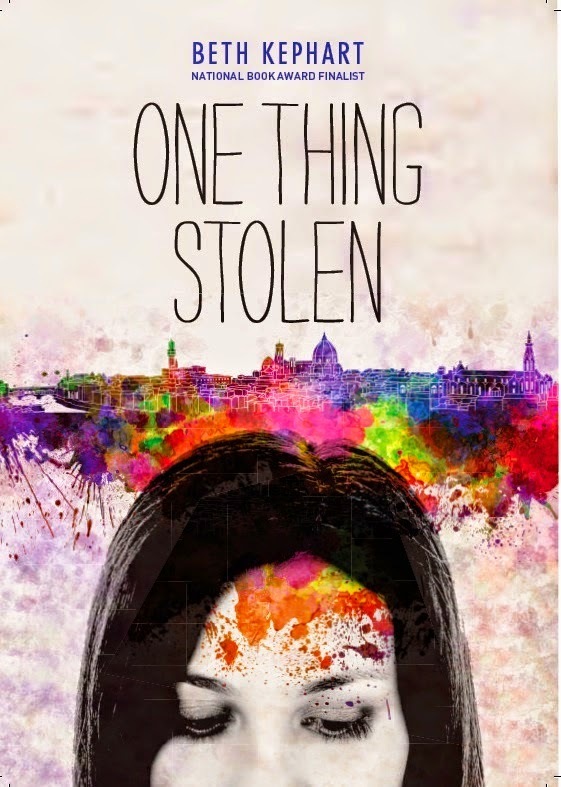 Reading ONE THING STOLEN is like finding something you never knew you lost. Nadia’s disorder, in some ways, frees her even though she is trapped by speech and memory loss. Just like she is able to roam the city, Nadia gives herself the liberty to live in the beauty of the moment. With the free-verse style narrative and muddled thoughts, the plot may be confusing, but the sense of mystery ultimately pulls the reader through. I love the characters, especially Nadia’s best friend Maggie, who she recounts in flashbacks of good times spent together — the type of friendship everyone envies. Nadia’s family brings hope to the readers as they learn to deal with Nadia’s wandering mind. ONE THING STOLEN is artistic, dauntless and haunting from the beginning to the end. 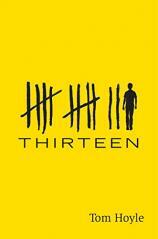 THIRTEEN is author Tom Hoyle’s debut novel, and it’s sure to keep readers up late at night. Thirteen boys were born at midnight on the stroke of the new millennium, and twelve of them are dead. They were killed by a cult called “The People” that believes that an imagined “Master” commanded them to do so. However, 13-year-old Adam is the last one on the list. He has absolutely no idea of the dire danger he is in. Time is running out, for not only Adam, but also the lives of an entire city. Set in iconic London, this thriller will keep readers on their toes as they meet characters who may or may not be trustworthy. This book certainly keeps the pages turning, but readers will have to suspend their disbelief in the plot. I thought that the plot seemed highly unbelievable in the modern world, with little to no police/adult involvement concerning the murders “The People” have committed. Personally, I simply couldn’t buy that such a big cult existed right under the noses of top-notch police officers and detectives. However, when I reached the Appendix, which shared information on real-life cults, I was shocked that such things do exist — hundreds have died at the hands of cults throughout history. This was perhaps the most haunting revelation I got from THIRTEEN; though “The People” is fiction, what happened to Adam may have been a variation of something that actually occurred in the past. THIRTEEN is full of interesting characters, from our unpredictable, smart hero, Adam, to the sly, zealous Viper, a girl who works with “The People”. Though Hoyle’s dialogue falls short in its well-meaning attempt to emulate teen-speak, he certainly knows how to write visceral action with perfect word-choice. He paints pictures that can range from relatively bloodless to gruesomely gory, depending on the reader’s imaginations. The strongest aspects of THIRTEEN are its action-packed scenes and sense of mystery, which will propel readers through the book in no time. Here is my Inherit Midnight Review! To outsiders, it seems like Avery has it all—living in a mansion, going to a boarding school and being pampered by her wealthy grandmother. However, all is not as it seems. Avery is an illegitimate daughter, the product of a scandal in the VanDemere family. When Grandmother VanDemere decides to set up a complex game across the globe to see who in the family is worthy to inherit her fortune, Avery leaps at the chance to show her relatives what she’s capable of…and also find what really happened to her mother, who Avery believed was dead. 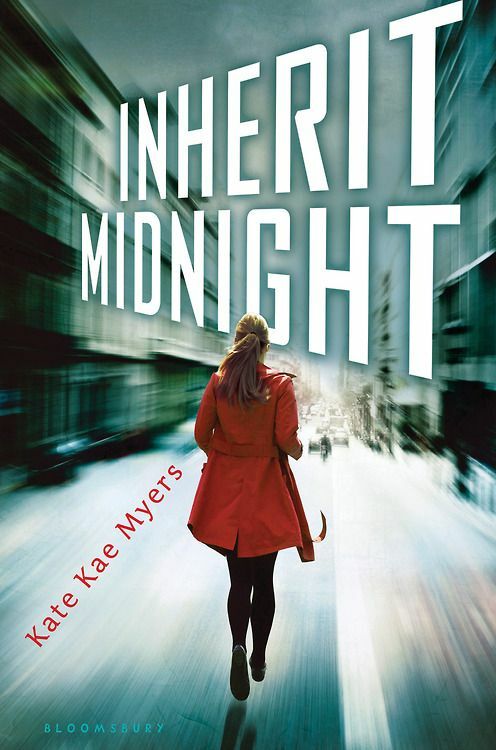 INHERIT MIDNIGHT may smack of 39 CLUES, but with less characters and less clues, the story is more character-driven than one would think. Though each “challenge” Grandmother VanDemere sets them on is interesting and page turning, what the reader is really invested in is Avery’s growth as a character. From standing up to bullying to falling in love, from discovering pieces of the VanDemere history to discovering pieces of her own past, Avery’s arc will certainly hold readers until the very last line. Each character is thoroughly developed, and when the players interact, INHERIT MIDNIGHT becomes a truly delicious read. Filled with betrayals, revenge, hatred, violence and greed, the game is taken to the next level when despicable characters take the mentality of every-man-for-himself. From wrathful Uncle Marshall to mean girl Thisby to conniving Daisy to brutal Chase, the game is sure to keep readers on edge. And sometimes the reader finds kindness in unexpected people, making Avery’s journey all the more rewarding. History junkies will love how each challenge “reenacts” a story from pages of a text book—in fact, there’s even a simulation involving a paintball version of a Revolutionary War battle. Romantics won’t be able to resist the charm of Riley, the son of Grandma VanDemere’s lawyer. Action thrill-seekers can vividly imagine themselves rappeling down the sides of a gaping hole or running through a forest avoiding bullets whizzing through the air. Puzzle solvers, like me, will pump their fists in the air when they figure out a hidden clue before Avery and Riley do. INHERIT MIDNIGHT truly has something for everyone. 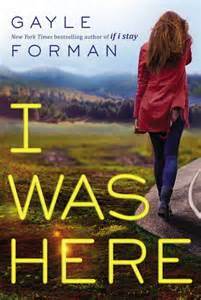 Here’s my review for I WAS HERE by Gayle Forman! Author Gayle Forman writes I Was Here with a grounded narrative tone that draws readers into the story, keeping them hooked page after page. When Cody’s best friend Meg commits suicide, Cody is naturally reeling with immense heartbreak and guilt. However, when she travels to collect Meg’s things at her college, she discovers two things: an encrypted file on Meg’s computer and Ben McCallister, the boy who broke Meg’s heart. Suddenly, all that Cody believes about Meg’s death is shaken up. Although she sets down the path to find the truth about Meg, I Was Here is actually a devastatingly moving journey of self-discovery. The characters are never pigeon-holed into a stereotype—Forman develops them so well that the characters themselves set aside Forman’s book from its peers in the Young Adult genre. I love the relationship Meg has with every character in the book, from her distant mother to Meg’s little brother. The themes are rich and poignant, dealing with death, guilt, friendship, and love. I Was Here draws such beautiful moments and memories weaved with philosophical musings of life that will certainly supply readers food for thought. Pearl’s mother is dead because of Pearl’s little sister, who she calls “The Rat.” It’s already hard enough for Pearl to cope without frequent visions of her mother, who gives snarky advice and keeps up with old habits such as smoking and cursing. In this coming-of-age story, themes such as grief, guilt, blame and friendship play a prominent role as Pearl is forced to come to terms with the death of her mother and the birth of her sister. Pearl’s journey to rediscover herself makes THE YEAR OF THE RAT a rewarding and profound read. In a way, Pearl’s scenes with the dead are the most grounded and realistic conversations in the book. The author’s humorous yet poignant dialogue fleshes all the characters out. Teenagers will be able to relate to the rollercoaster of emotions that Pearl experiences. While at points her narrative voice does become too whiny, these moments allow us to see true character growth throughout the book. There is beauty to be found in Furniss’ simplistic style. My favorite aspect of the book is that there is no filter, and Furniss doesn’t sugarcoat Pearl’s mother’s death. It’s a raw, real scene when Pearl curses her mother for leaving her. 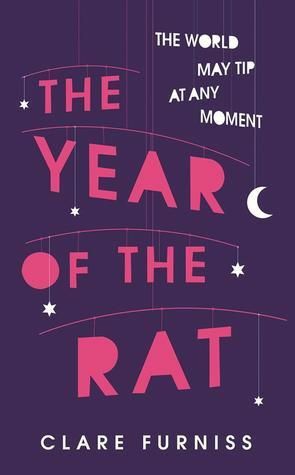 Pearl’s journey to rediscover herself makes THE YEAR OF THE RAT a rewarding and profound read. The end of the world as we know it is quickly approaching, and the fate of humanity lies on the shoulders of twelve teenagers. These twelve descendants of the original civilizations of Earth, and they are Players. Trained from birth to be highly-skilled assassins, puzzle-solvers, and survivors, the Players must find the first of three keys, hidden somewhere on the planet. The Player who wins the Endgame will save his or her race, but all others will be exterminated. It’s a fascinating premise, albeit familiar to young adult readers interested in the dystopian genre. Inevitably critics will compare it to the Hunger Games—and though they do share many similarities (twelve “tributes” in a deadly “game,” a fight to the death, an initial bloodbath, and romance in between the action)—Endgame is told very differently. Author James Frey jumps around from each of the players’ perspective from chapter to chapter, and it’s not at all difficult to follow because of the distinct fleshed-out characters he’s created. Despite the fact that the storytelling and plot isn’t as well thought out as Hunger Games, Endgame still succeeds because it has higher, deadlier stakes. In addition, Endgame is bigger than the book itself. Puzzles are scattered throughout the pages, and some are puzzles meant for the characters, but others are meant for the reader. The clues—which may take you online and to actual locations as well—will lead to a key, unlocking a cash prize in real life. It’s an epic premise with a lot of promise. 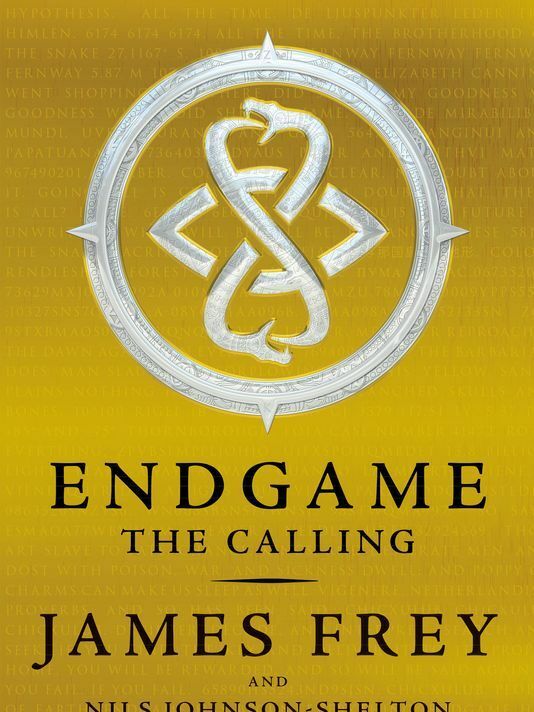 Even without the puzzles, Endgame is still a page-turner with memorable characters and heart-racing action, perfect for the young adult target. Jessamin is a quick-witted, sharp-tongued girl who is reluctant to move from her island home to the country of Albion. However, her resentment doesn’t last long as she finds herself pulled into a dangerous world of politics, power, status and magic. Everything changes when she meets Finn, a dashing young man clouded in mystery. With Jessamin in the picture, his political enemy sees his opening to make a move, and suddenly many lives hang in perilous balance — including her own. She discovers both friends and magic along the way, fighting to protect both so the nefarious Lord Downpike will not get an upper hand. Author Kiersten White spins a complicated, heavily political tale. The book’s saving grace is its witty dialogue between charismatic, fleshed-out characters. At moments, the plot meanders, but this just allows more time for readers to delight in Jessamin and Finn’s adorable chemistry. I especially enjoyed reading Jessamin’s internal thoughts and commentary — this is a girl who knows how to stand up for herself and others. White subtlety hits on different topics such as gender equality, social status and political expansion. The magic is gripping and tangible. With the references to teacups and rabbits, I was reminded of ALICE IN WONDERLAND. White writes with Lewis Carol’s instinct for capturing magical settings, picking out details that allow readers to visualize scenes in vivid detail. While it’s easy to get lost in the long passages explaining political background, readers who hold on will be rewarded with an unexpected plot twist. Though their victory doesn’t feel earned, at least our two lovely main characters get to enjoy a satisfying ending. 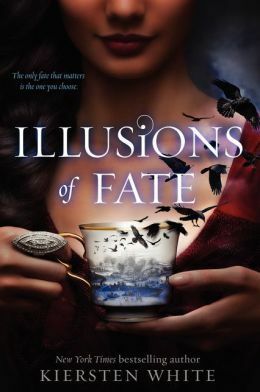 Young readers will enjoy ILLUSIONS OF FATE, a riveting page-turner with relatable characters and interesting concepts of magic.